In 'The Stone Sky,' Some Worlds Need To Burn N.K. Jemisin won Hugo Awards for the first two volumes of her Broken Earth trilogy. The Stone Sky is a powerful, timely finale to this story of a world built on oppression and exploitation. Concluding a trilogy is a tricky business — not least when its first two installments have been justly honored with the highest awards in genre fiction. 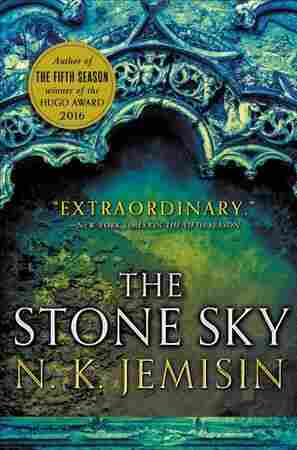 N. K. Jemisin's The Obelisk Gate, like The Fifth Season before it, won the Hugo Award for Best Novel last weekend, just in time to pave the way for The Stone Sky with well-deserved acclaim. But the fact that The Stone Sky sticks the landing of this astonishing trilogy with timeliness and rigor is the smallest, simplest thing I have to say about it. The gratitude and love I feel for these books, and for what The Stone Sky adds to the triptych, is staggering. The world of the Stillness is one of constant turmoil: The ground beneath people's feet is treacherously prone to quakes, to the point where everyone speaks of the Evil Earth. Strange remnants of dead civilisations, called Obelisks, float through a sky with no moon in it. Life has bent over millennia to accommodate Fifth Seasons, the world-changing experience of an earthquake that damages the environment for generations. The only reason humanity's survived this shifting landscape at all is the work of orogenes, people born with the innate ability to manipulate thermodynamics and quell a quake before it starts — but this power has made them a degraded, detested and oppressed minority for centuries. If the Broken Earth trilogy as a whole shows a world where cataclysm and upheaval is the norm, 'The Stone Sky' interrogates what right worlds built on oppression and genocide have to exist. Enter Essun, a middle-aged woman who's lived through more horror than most, and who is now the world's most skilled orogene, given the unenviable task of harnessing power from the Obelisks in order to catch the wayward moon and bring the Seasons to an end with the help of a Stone Eater named Hoa — not quite human, and older than the Seasons. Meanwhile, on the other side of the Stillness, her young daughter Nassun's powers are growing — and a rival faction of Stone Eaters are guiding her to use the Obelisks for their own ends. Weaving their stories together is Hoa's narration, explaining the dead world he came from, the origin of the Obelisks, orogeny, and how — not to mention why — they lost the moon in the first place. From a storytelling perspective, The Stone Sky satisfied me completely. With the same fiercely compelling voice and character work that made the first two volumes so eminently devourable, it travels deeply difficult terrain and emerges triumphant. I could talk about how the escalating use of magic never feels confusing, even at its most elaborate; I could talk about how the introduction of entirely new information in the third book is remarkably interleaved with everything that's become familiar. I could talk about how brilliantly each book shoulders its portion of narrative weight, and how the phases of Essun's life are fragmented reflections of the traumas that built the world in which she lives. But it's the texture, not the structure, of the story that I want to address here, and in which I see The Stone Sky's sharpest success. "Some worlds are built on a fault line of pain, held up by nightmares. Don't lament when those worlds fall. Rage that they were built doomed in the first place." "For some crimes, there is no fitting justice — only reparation." "Every season is the Season for us." I ate these sentences up and only felt hungrier for more: the affirmation of anger, the recognition of hidden horrors, the rejection of docile complicity. I ate these sentences up and only felt hungrier for more: the affirmation of anger, the recognition of hidden horrors, the rejection of docile complicity. Every season is the Season for us. For how many people on our planet has the world ended, sometimes multiply in one lifetime, in order for others to preserve a certain lifestyle? For how many millions is weathering apocalypse the norm, a matter of course? At one point Hoa mentions Earthtalk, a way Stone Eaters have of speaking to each other in texture and feeling instead of sound, so that those who oppress and use them — and whose language they speak — cannot hear them. The tension between what is said out loud and what isn't is a language in and of itself, one so familiar to me as a three-tongued child of immigrants that I felt punched in the heart. I don't want to stop talking about this story. I don't want to count words. Let me leave it at this: The depth and breadth of Jemisin's achievement with this trilogy is geologic. These books are a revolution in which I want to take part.